When police saw two men with no tops on pushing each other on a grass bank one of them claimed the officers were invading his space. Sean McConaghy (19), whose address was given as Filbin Crescent, Lurgan, was fined £150 last Wednesday for disorderly behaviour on August 31 this year. 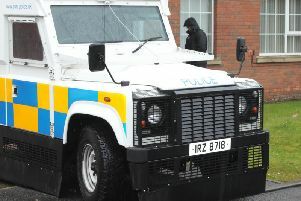 The court heard that at 6.50pm police received a call from a member of the public about of a group of youths in the Ballyoran Park area of Portadown. Most of them complied with the police but there were two males with their tops off on a grass bank swearing loudly and pushing their chests out. McConaghy told them ‘you are invading my space’ and ‘you may get the whole of Mahon Road down here, I’ll kick the f—k out of the lot of them’. As he was taken away towards a patrol car he calmed down. An object was thrown from the group of youths and it smashed the rear window of the vehicle. McConaghy got out and told them to ‘f—k off’ and as he was being taken away he apologised again. Mr Pat Vernon, representing the defendant, said that a large group of youths had gathered. He added that his client accepted he was drunk and there was a lot of ‘macho posturing’ and swearing between those in the group. Mr Vernon said the disorderly behaviour was clearly verbal and McConaghy soon calmed down until a stone was thrown and he got out of the car and told them to stop. He explained that a family friend came along and said McConaghy could stay at their house and he was de-arrested by police.